For some of us the regular season ended this last week and our seasons are over. For some, we play this week before the playoffs begin, with or without us. So instead of the normal Buy/Sell I am going to focus mostly on the BUY and not so much on the SELL. 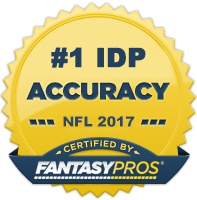 Truth be told, scoring systems for the IDP side of the ball differ so greatly from league to league it makes it difficult to generalize things. At this point of the year, you know who is worth dropping, and if not, leave a comment below and we’ll tell you how we feel about a certain player. This is the 3rd consecutive week I mention McCarthy. There is a reason, the guy is a legitimate stud. Ruud has been replaced and will not get his job back. McCarthy is playing in BEAST MODE! This past week he had 9-0-0 with 1 FF and 2 Fumbles Recovered. If for some ungodly reason he is still available on your waiver wire, get him NOW! 7-1-1.5. That was what he did last week vs. Carolina in only his 2nd career start. Bowers is a bit of a late bloomer for the 2011 fantasy season, but DL are hard to come by and any DE that racks up 8 tackles is worth a shot. Especially one with Bowers’ raw natural ability. Maybin has 6 sacks since joining the Jets and is still just 23 years old. Already a favorite of Rex Ryan, Maybin has been given the role of pass rush specialist. He’ll be much more appealing in leagues that reward heavily for sacks. The one thing the Jets D lacks in pass rushers so I expect Maybin’s role to only increase next season. Chuck Pagano has found ways to keep this defense dominant and draft steals like Pernell McPhee are why. McPhee has racked up 6 sacks as another pass rush specialist. Playing on a Defense that has to account for Terrell Suggs, Haloti Ngata, Ray Lewis, and Ed Reed EVERY single play will allow a relatively unknown rookie or player to capitalize. On one of the most aggressive D’s in the league, McPhee is worth adding as a Dynasty stash. Sheard leads the Browns with 5.5 Sacks and 5 FF. Now with 3 consecutive games with a sack, Sheard has been on a tear! And with the pass happy Steelers and the oft sacked Roethlisberger next up on the schedule, it’s likely that it will be 4 games in a row. The long term outlook for Sheard is a great one as Cleveland seems to have hit gold with both rookies, Phil Taylor and Sheard on the D-line. Smith is now up to 9.5 sacks in his rookie season and even though he hit a slow spot where he did not register a sack in 3 of 4 games, he busted back onto the scene last week popping off 2 more. He’s far exceeded even the loftiest expectations and next year could be even better when he takes on more of a full time role.